Twice a month I join a group of ladies who knit/crochet for local charities. Everyone brings their own projects, and we sit and chat while we work. Over the holidays, I pulled a hank of yarn from my stash and decided to knit some headbands/ear warmers for the group. The younger kids seem to wear them more than hats. The yarn was purchased at the guild's Fiber Fest in 2016. Pattern: Bea's Headband (Bea was a fun lady who was in the Tuesday night knitting group for several years. She moved to Colorado a couple of years ago. 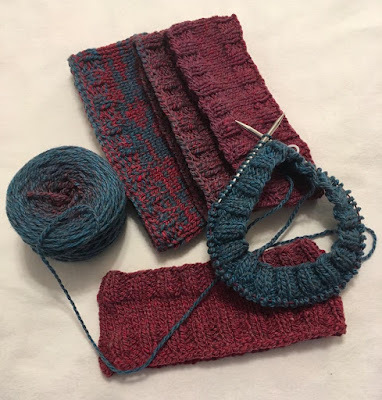 Notes: because the yarn I used was bulky, I knit with only one strand of yarn; although, the blue/red headband in the photo was knit with two strands. I thought the two strands of bulky yarn made a headband that was almost too thick; although, it might be good for someone who skis. I love these! And, it was cold enough on the 1st when I walked that I used a fleece headband plus a hat. I'm going to make some of these - they will be great Christmas gifts next year. thanks for sharing the pattern. Very pretty and so practical. I liked a headband when I still skied, especially when it wasn't very cold. I wish I could knit...sniff, sniff. Haha! Love this project! Oh Nancy. THank you . i love the look and I may have to take a candle flame shawl break to knit a few of these this weekend. Lovely!!!! When I was a kid, I always preferred headbands - they worked much better with hair that was in a bun or pony tail all the time. Thanks for this grea pattern! Looks like it could be used by men or women. I'm definitely going to make one (or more). Great pattern! Thanks a bunch. I think I'll make a couple for the GDs. What a great way to use those leftovers! LOVE those colors. Such a good idea, especially for the teens. They do seem to prefer them over hats. Nancy, this is a brilliant idea! I love it. Maybe I can make a few of these from stash for a few nice girls I know. Just an amazing project-thanks for sharing. My Mom makes tons of hats and mittens for charity; she would enjoy adding this to her donations! That is a great charity project. Useful and easy. A few years ago I knit a bunch of mittens for children on the Pine Ridge Reservation. I really need to do more charity knitting. What a perfect idea! Quick, easy! Who could ask for more?